San Francisco Requires New Buildings To Install Solar Panels : The Two-Way San Francisco already required buildings to be "solar ready," and starting in 2017, actual panels will be mandated. It's the first major U.S. city to take such a step, according to the bill's sponsor. Workers install solar panels on the roof of a home in Camarillo, Calif., in 2013. San Francisco has recently decided to start requiring rooftop solar systems — electrical or heating — on new construction up to 10 stories tall. 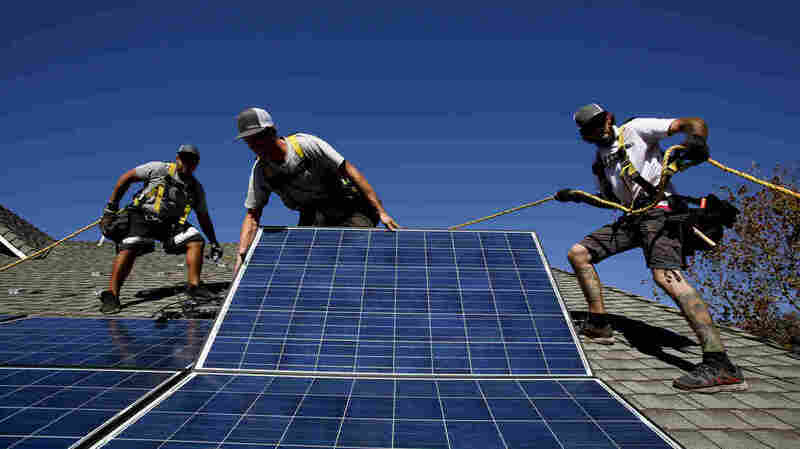 The ordinance, which was passed unanimously by the city's Board of Supervisors, builds on an existing California law requiring new buildings to set aside 15 percent of the roof as "solar ready" — clear and unshaded. That law applies to residential and commercial buildings 10 stories or shorter. Now, instead of just preparing the roof for solar panels, such buildings would need to actually install some form of solar energy — either electricity-generating panels or solar heating units. It's a step toward San Francisco's goal of meeting the city's electrical demands with 100 percent renewable energy, Wiener notes in his statement. "Activating underutilized roof space is a smart and efficient way to promote the use of solar energy and improve our environment," he says. "We need to continue to pursue aggressive renewable energy policies to ensure a sustainable future for our city and our region." "As a coastal city located on the tip of a peninsula, San Francisco is vulnerable to sea level rise, and human activities releasing greenhouse gases into the atmosphere cause increases in worldwide average temperature, which contribute to melting of glaciers and thermal expansion of ocean water — resulting in rising sea levels. "San Francisco is already experiencing the repercussions of excessive CO2 emissions as rising sea levels threaten the City's shoreline and infrastructure, have caused significant erosion, increased impacts to infrastructure during extreme tides, and have caused the City to expend funds to modify the sewer system." Reaction to the ordinance has been mixed. Two of San Francisco's former environment commissioners, both advocates for solar power, celebrated the news. Fortune magazine notes that the new requirement is an extra hurdle for development in a city where new construction is already "notoriously difficult." But Engadget suggests the impact of the law might not be that dramatic — San Francisco isn't seeing a ton of new buildings that are under 10 stories tall, the website says. And Vox argues that boosting city density might have an even bigger impact on carbon levels than the solar panel law. The new requirement goes into effect at the beginning of 2017.